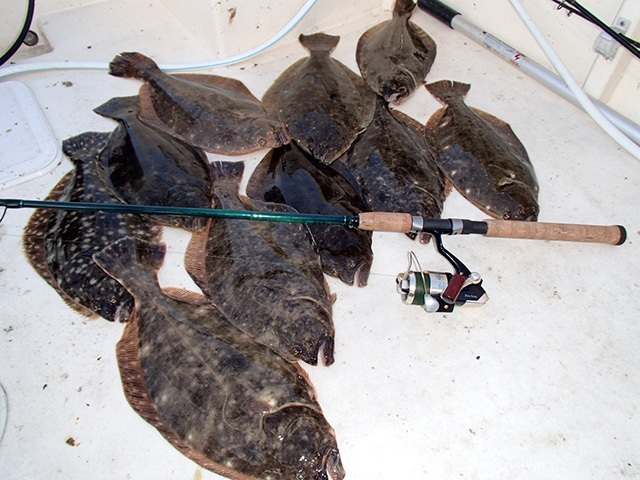 Tips to make the most out of the New Jersey summer flounder bite..
"Doormat" summer flounder topping 10 pounds invade New Jersey's back bays and nearshore waters ever year and are a blast to catch on light tackle. 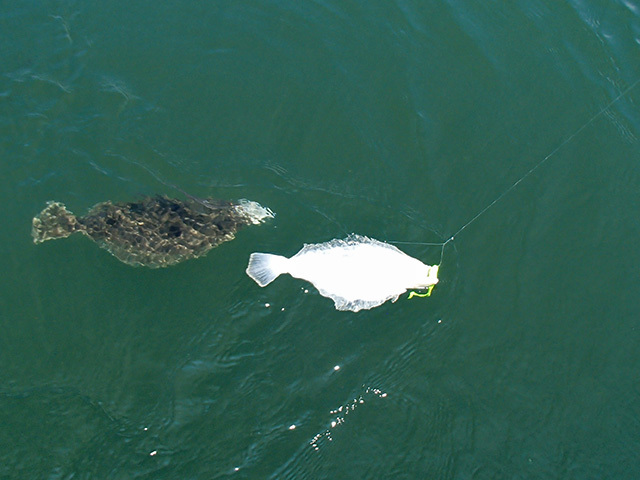 Strip baits cut from a flounder, salmon or albacore belly, bluefish or sea robin entice big fluke when deployed on a tandem, sliding snell rig. Use a dropper loop when rigging bucktails to add a secondary teaser for some extra flash. You might even score the elusive double hook-up! Doctor up the bucktails with fresh strip baits and soft plastic or Gulp! 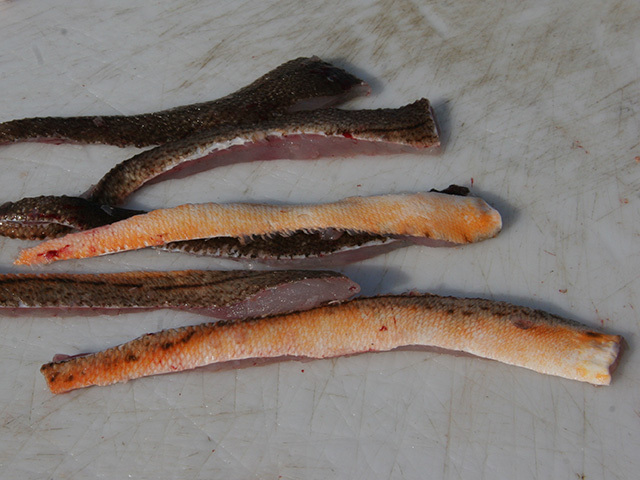 grubtails to lure big flounder from their hiding spots. When the bite turns on and the action gets hot and heavy, you can fill a fish box with tasty fillets in no time. 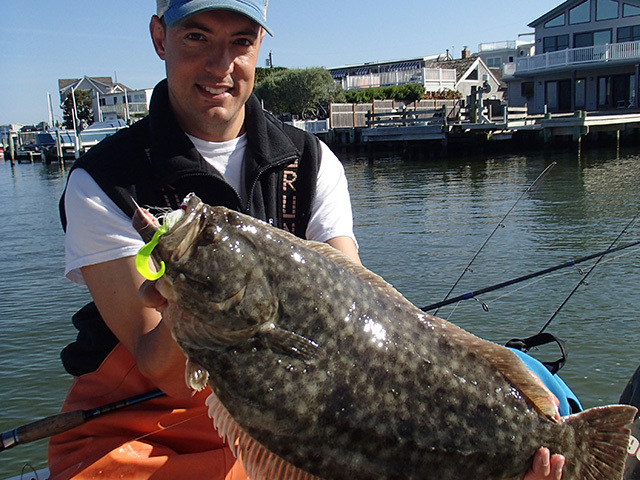 Every summer and into fall, New Jersey's summer flounder lay out the welcome mat or 'doormat' as anglers here call the big fluke that surpass the 10-pound mark. Any flatfish over five pounds is a solid catch in anyone's book, but there are a few tricks you can employ to help you key in on these large-model flatties. Hands down, live baits score some of the largest fluke around, and five top live baits really stand out among fluke fanatics: snapper bluefish, peanut bunker, spot, mullet and killies. For larger baits like spot or snapper blues, a go-to live-lining rig consists of a 1/2- to 3-ounce sliding egg sinker or fish-finder slide clip with an appropriately sized bank sinker on the running line, 75-pound barrel swivel, 36-inch section of 25-pound fluorocarbon leader and size 4/0 Gamakatsu Octopus hook or live bait hook. Scale down the hook size to a 2/0 or 3/0 for smaller baits like killies and peanut bunker. If you’re fishing a swift drift, hook the baitfish through the lips or nostrils to present a bait that looks natural as it swims with the tide. If you're fishing a slack tide, hook larger baits through the back dorsal fin for a more natural presentation. You can also hook baits underneath the belly to encourage them to swim frantically upward off of the bottom, which will entice a fluke to strike when water movement is nil. 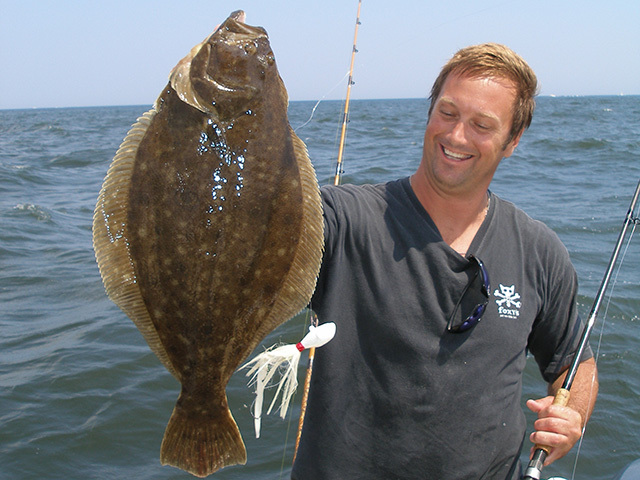 After the initial bump when a fluke pounces on a bait, count to five, lock the reel and begin reeling to set the hook. Conventional reels are preferred when live-baiting as line can be fed back to the fish smoothly and with minimal resistance, then engaged quickly for the hook-set. Live-baiting is applicable across most saltwater arenas including shallow areas of back bays in depths of 5 to 20 feet, deep bay channels of 70 feet or more, and oceanside drifting over humps and ledges. When fishing with strip baits, the same type of sliding-sinker, live-bait rig can be used. Long, undulating 8- to 12-inch long strip baits cut from a flounder, salmon or albacore belly, bluefish, or sea robin work best. Cut the fillets into one-half to 1-inch wide strips and taper them off at both ends so the strip runs through the water straight and doesn't spin. Many strip-baiters opt to utilize a tandem sliding snell rig, consisting of a 3/0 Octopus hook with a sliding snell that connects to a 2/0 Octopus hook to help ensure a solid hook-set. Pierce the top hook through the tip of the strip then stick the other hook into the middle of the strip bait about three inches down. Bucktail jigs will definitely fool doormat flounder but the key to success is choosing the right jig for the right environment and working the lure correctly. The optimal bucktail for shallow back bays is the 3/8- to 1/2-ounce standard roundhead style, with most productive colors being white, chartreuse, and white/yellow. Fishing in waters 25 feet deep and greater requires you amp up to 2- to 6-ounce Spro models that can hold ground on swifter drifts. Bucktail rigs are simple to tie and the same rig can be used when bay or ocean fluking, regardless of jig size. From the running line, tie on a low profile 75-pound Spro barrel swivel followed by a 30-inch section of 20- to 25-pound fluorocarbon leader. Tie a dropper loop 16 inches up from your bucktail for a teaser, and then attach your bucktail with a loop knot. The loop knot will allow for an enticing, bouncy action every time you lift and drop the bucktail. White 2/0 to 3/0 bucktail streamers flutter in the current and act as a teaser to pull big doormats out of their hiding spots. Doctor up the bucktails themselves with fresh strip baits cut a half-inch wide and 5- to 10-inches long. Bait choice can be opportunistic, but mackerel, bluefish, hickory shad, or other store-bought offerings like squid always work well. Another good lure is a 3- to 6-inch Berkeley Gulp! Swimmin’ Mullet grubtail threaded on a 3/0 Octopus hook. When fishing bucktails, timing the tide can make the difference between a bang up day or mediocre outing, so be sure to check the latest tide tables before you go. The number one factor to ensure success in is to have an angle of approach between vertical and 45-degrees. Slow drifts allow for the best up-and-down presentation, so premiere tides revolve around the last hour of the incoming tide, the slack and the first hour of the outgoing tide. Avoid mid-tide conditions when the current really begins to rip. When the current starts really pouring in or out it will negatively alter the action of the bucktail, impeding its magic motion. Back-bay bucktailing setups include a 6 1/2- to 7-foot medium- to fast-action spinning rod matched with a 3000 to 4000 class Shimano Sustain reel spooled with 20-pound braided line. On the outside in nearshore waters, amp up to a stout 7-foot medium-action rod rated for 15- to 30-pound test. Always use braided line which provides ultimate sensitivity when detecting strikes on the bottom. I prefer spinning outfits because you can really launch light bucktails and cover more ground during times of little or no water movement. Ocean fluking outfits for drifting live baits or strip baits include 7-foot medium-action conventional rods such as a Lamiglas 7020BL, matched with a Shimano 16 Torium type reel spooled with 50-pound braided line.